1. Cardinality: The total number of rows processed at each level of a query. 2. Query Plan: Algorithm to use to perform a task like searching, sorting etc. When we execute a SQL query, create an index, insert records into a table etc SQL server automatically creates or updates the statistics of key fields of tables. In simple words, we can say statistics is an object which keeps information about total numbers of distinct records in a table. So, Query 1 has to go for approximately 18 times more logical read than query 2. We can observe query 1 is using index scan while query 2 is an index seek and overall cost of query 1 is 96% while of query 2 is only 4%. So, now we can say query2 is much better than query 1. So, Query 1 has to go for approximately 160 times more logical read than query 2. 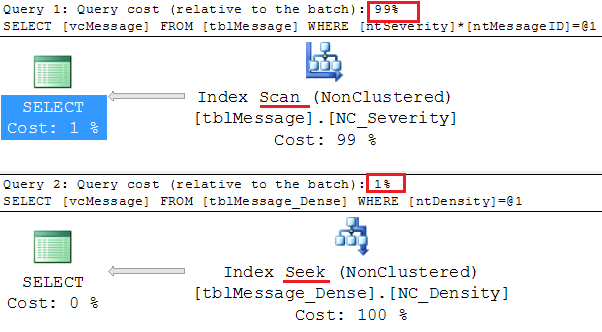 Now if we will check the actual execution plan of both of the query we will observe query 1 is using index scan while query 2 is an index seek and overall cost of query 1 is 99% while of query 2 is only 1%. Note: Default collation of SQL server is the case insensitive so no need of user LOWER function to perform a case-insensitive comparison. If default collation of your database or table or column is case sensitive then we should use COLLATE clause with any case in insensitive collation. Question: Why query 2 is performing better than query 1 in all of the above examples? 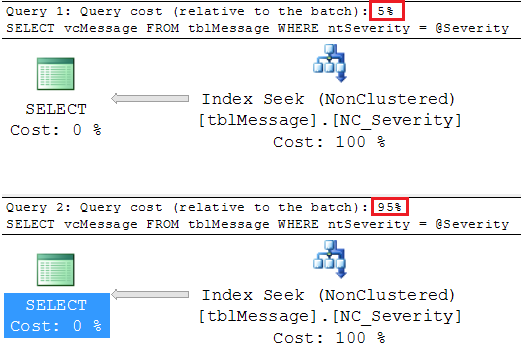 Answer: If you will notice the WHERE clause in all above examples in query 1, you will get that we are performing some operations with the field of table tblMessage while in query 2 equivalent value has used in a constant expression. 2. A scalar operation like addition, multiplication etc. In this situation, the sql server query optimizer is not able to estimate correct cardinality using statistics. Tips: If possible, don't perform any operation on any field of a table in WHERE Clause, ON Clause, HAVING Clause. Instead of this, write an equivalent constant expression. Total query cost of query 2 is 96% while query 1 is only 4%!!! What wrong with query 2? Again, same cause. The query optimizer is not able to get correct cardinality use statistics. 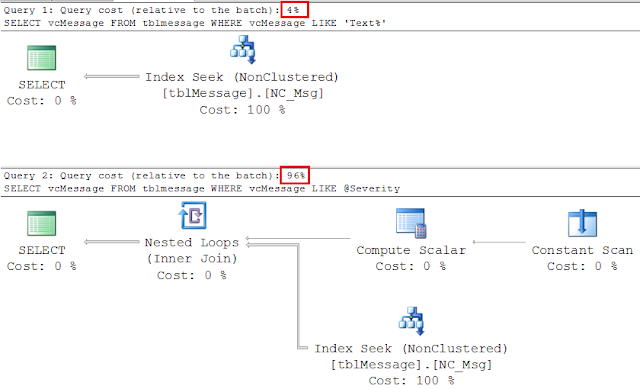 If we will use local variables in query predicate, the sql server query optimizer is not able to estimate correct cardinality using statistics. Don't use local variables in WHERE Clause, ON Clause, HAVING Clause. Instead of this, use constant expressions. Question: How to resolve this problem when this variable is the parameter of stored procedures or functions? If there is any cross relationship among different fields of a table in query predicate, SQL Server query optimizer is not able to estimate correct cardinality using statistics. So, Query 1 has to go for approximately 165 times more logical read than query 2. We can observe query 1 is using index scan while query 2 is an index seek and overall cost of query 1 is 99% while of query 2 is only 1%. So, now we can say query 2 is much better than query 1. Note: Good news, a non–persisted computed column is not stored physically in memory. If there is any cross relationship among fields or there is a complex expression in a field in a query predicates, it is better to create a computed column and then create a non-clustered index on it. 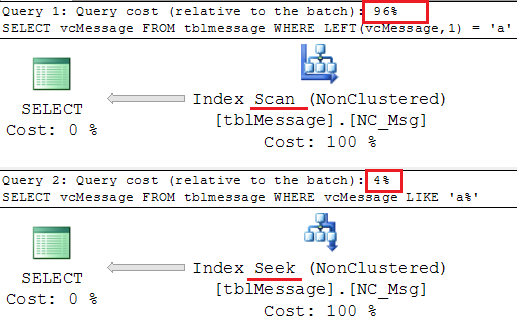 From query performance point of view, both queries have exactly same execution cost. There are no differences, either we use a constant expression or pass it as a parameter. If possible, don't update the value of parameters of a function or stored procedure before using in SQL statement, instead of this pass the updated value to the parameters. Note: Don't use this query at production server. Here we can observe estimated cardinally of query 2 is equal to the estimated cardinality of query 1. In SQL server creates the statistics of any parameters of stored procedures or functions on the basis of value to pass parameters when it has executed the first time. Next time onward it uses the same cardinality if statistics, query plan etc doesn't change. Due to the wrong estimation of cardinality query optimizer can choose wrong execution plan which may decrease the performance of queries. Use OPTIMIZE FOR clause when you want to optimize a SQL query on the basis of a specific parameter value. As we know NULL is never equal to any value. We use IS NULL to compare the null values. So this query will not return any result set. If a query doesn't return any value it cardinality will be one. And from application use only the stored procedure uspGetMsg. If you want to update the value parameter of a stored procedure or a function create a similar procedure or function and execute it form base procedure or function by passing the updated value as a parameter. In SQL server, the default setting of auto creates and updates statistics is on except asynchronous statistics. It means query optimizer automatically creates and updates the statistics according to requirement. More specifically it auto creates the statistics of a table for primary key columns when we create a table, for key columns of clustered and non-clustered index when we create indexes, for query predicates when we execute the query and updates the statistics when threshold limit reach after the update, deletion or insertions of records. Limitation: Query optimizer can create only single columns statistics and also it cannot create filtered statistics. So, now query will perform better. Create user-defined multi-column statistics if query predicates have more than one fields of a table.